This page divides rides with climbs into areas. Each area is centered around a town, that can act as a support base of sorts. All of these pages have descriptions and elevation profiles. All of the paved summits in this area are part of the Copper Mountain Triangle ride, a popular day tour. 1. Vail Pass -- the highest point on the Copper Triangle, and also a stage on the first pro racing challenge. 2. Fremont Pass - Fremont never crossed this pass. But see who did on the page. 3. Tennessee Pass - This pass was created for a traffic pattern where all roads lead to Leadville, not Denver. It managed to make the transition. 4. Battle Hill Summit - a major bump in the road, when riding up the south side of Tennessee Pass. All of the popular mountain biking summits listed below are inside of the "Copper Mountain Triangle". For longer rides on a variety of surfaces, mix and match. Among the most heavily ridden trail rides in the area is probably the Commando Run trail. I haven't been able to get a elevation profile for that ride yet. Some other popular rides are. 2. FR745 Lime Creek Road s(u) - You can do this one in combination with Shrine Pass. 3. 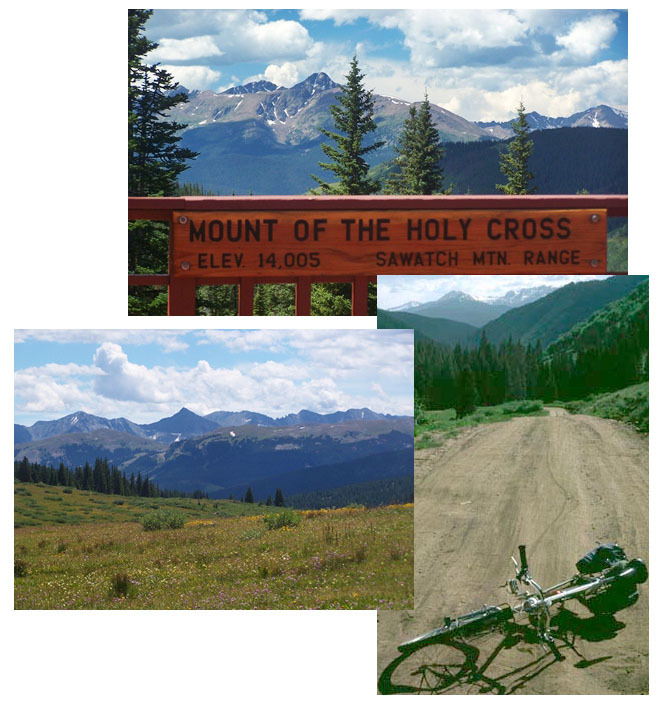 Colorado Trail: m139.9 section: Camp Hale - Tennessee Pass rd cr. (sh) - Of course you can just keep going on the Colorado Trail, then you'll end up on a summit point in the Leadville section. FAV1. FR708 Resolution Mountain s(u) This one requires a short walk, but the views are worth it. This is also a cross country skiing destination, and it is interesting to compare summer and winter pictures. MORE1: FR751: Ptarmingan Hill(sh) This is a variation on the FR708 Resolution Mountain s(u) ride, and it also includes a short bushwack hiking section to make it into a loop. One of the organizers of the Leadville 100 race once said "Leadville can't be replicated. The altitude can't be taken anywhere else. And it's true, at 10280 feet it is blissfully cool, while the Front Range cities are baking in the oven. 2. Sugarloaf Pass - This summit point is on the Leaville 100 mountain bike race. On one day you will see 1800 people go over it, which by definition makes it very popular. FAV1: Mosquito Pass - It's really rocky and steep, but you can't get any higher or see any further on a track this wide. FAV2: Hagerman Pass - Part of it is a railroad grade - no low gears needed - the other part is the construction road for the railroad grade - low gears needed. pop3: Co145 Alta Lakes to(sh): This point on the Lizard Head Pass road is the summit for a popular loop ride over the Galloping Goose Trail. But you can also substitute other roads for this trail. FAV1: Wasatch Connector Trail s(u): The top is very scenic and very ridable. But to get there requires a bit of walking. FAV2: FR618 s(u): a dirt road ride east of Telluride, approaching the Lone Cone area. MORE1: Hastings Mesa s(u): This point is traversed during the popular Last Dollar Pass loop ride. It can also be the summit on other loops. Baxter Pass: How about a memorial day tour over Baxter Pass ? I can't think of an area in Colorado, that is more isolated than this pass. Traffic should not be a problem. FR869 Toll Road Gulch s(u) - this old toll road of Otto Mears has everything that a named pass has, except maybe a well known name. Old Rabbit Ears Pass -not just a jumping off point for trails above, but mostly. Columbine Pass - possibly the best paved out and back ride from Steamboat Springs. The other side is not so paved. FR150 California Park - Savery s(u) - northern Colorado plateaus at their best; partially also part of Great Divide bike touring route. CR52 Wolf Creek s(u) - nice to know it's there, in order to complete a loop over other summits.